Since it’s Friday, I thought I would share some fish recipes from Katherine Windham’s Booke of Cooking and Housekeeping of 1707, transcribed by my friends Bonnie Lovelock and Roger Sykes. Note the use of fish you will not find in the fishmonger’s or supermarket today. Felbrigg Hall has a large lake formed by damming a stream which runs down a shallow valley to the west of the house. I suspect that was the main source of freshwater fish like these. Other recipes include ‘crawfish’ (freshwater crayfish) which might be found in the stream itself. 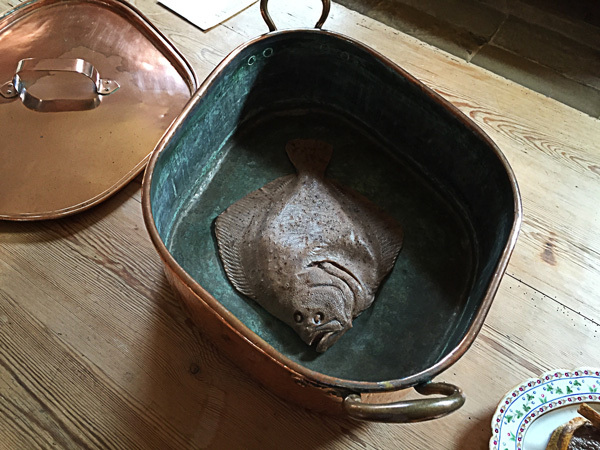 Oddly for a house barely four miles from the sea, there are few recipes for sea fish, other than flatfish. Oysters do figure heavily though. Perhaps this reflects the nature of the North Norfolk coastal area, which is mostly a strip of sea-marsh and freshwater marshes behind beaches of shingle. What few cliffs there are are low and easily worn away by the sea. Sea fish—any fish—did not keep well in the days before refrigeration, so a reliance on what could be found locally was probably the best way to avoid food-poisoning! Take yr carp a live & scale ym, wash ye scales off, lay ym in a dish, let ym blood in ye tail, yn take out ye Guts clean without breaking ym, yn wash ye belys with Claret vinager & salt, yn pour it on ym & a pint of Claret, so let ym lye a good while before you set ym on to stew, alow a pint of wine to every Carp, & 3 qu of a pint of water, & a qu of a pint of vinager, or more as it is in sharpness, a bundle of sweethearbs, cloves mace peper Ginger, horsradish, Lemon peel, 1 onion & 2 Anjovis, a litle peice of buter, put it all on ye fire together, when one side is don take ym of, & let ym stand a litle to Coole, yn turn ym & set ym on again, let them doe very softly.